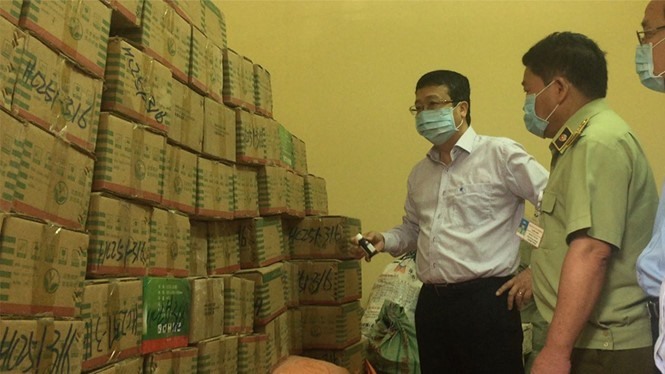 LẠNG SƠN — Some three tonnes of plant protection products smuggled from China were disposed on Wednesday. This was done by the Plant Protection Department under the Ministry of Agriculture and Rural Development in collaboration with Lạng Sơn Province Market Surveillance. According to Hoàng Trung, the department head, the entire stock of smuggled plant protection products was transported by a carriage for hazardous waste to a cement kiln in Hải Dương Province and disposed of by being burnt at a high temperature. The entire process will be strictly managed by the department. The stock of disposed plant protection products includes fruit ripening substances, plant growth stimulators and other hazardous substances such as mouse poison, snail poison and herbicides. Trung told Thanh niên (Young People) newspaper that the products were prohibited from being used in Việt Nam. Meanwhile, mouse poison, snail poison and herbicides feature on the list of group 1 substances, which are also known as “very toxic”. Hoàng Văn Sơn, deputy head of Lạng Sơn Province Market Surveillance, said that the smuggling of plant protection products was getting complicated. Traders usually divide the stock into smaller packs and hire porters to traffic products into Việt Nam. These products are then illegally distributed and sold in small markets to avoid the glare of State agencies. Three tonnes of disposed plant protection products had been seized in more than 520 smuggling cases. Therein, the provincial market surveillance handled 105 cases with a collected fine of nearly VNĐ240 million (US$10,500).